echo "Building Mysql 5.7 Folder"
echo "Migrate, finaly, to new version"
This guide is written having in mind MAMP 4.1.1 and MySQL 5.6. It considers known bugs from 5.6 and also a bunch of suggestions from other Gists. 170412 16:26:28 mysqld_safe error: log-error set to '/Applications/MAMP/logs/mysql_error_log.err', however file don't exists. Create writable for user 'mysql'. I've got the same issue as Avokaado. After running the script, I can't even start mysql server with MAMP. I "solved" this by installing MySQL 5.7 on Ubuntu server on Virtualbox and using MAMPs Apache & PHP only. I have same problem. But, it works for me now.. I had the same problem with the permissions of the /Applications/MAMP/db/mysql57/folder being incorrect, stopping the MySQL server from starting up. My solution was to simply duplicate the mysql56 folder in the Finder, rename the copy to mysql57 and start MAMP. It then offers to upgrade the databases for you. There is a problem with this script and MAMP PRO. MAMP and MAMP PRO share almost all their paths, but MAMP PRO recently moved the data directory from /Applications/MAMP/db/ to /Library/Application\ Support/appsolute/MAMP\ PRO/db/. So the "Building Mysql 5.7 Folder" section will not be operating on the right folders. 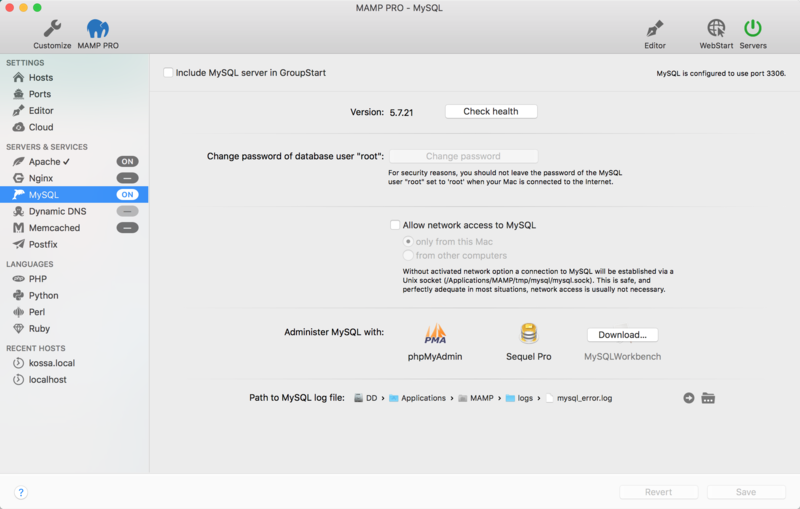 Furthermore the /Applications/MAMP/Library/bin/mysqld_safe file in MAMP will reference DATADIR=/Applications/MAMP/db/mysql57, which means MAMP PRO on next launch will look for the databases in the old MAMP location. Now you can use the Starting MySQL command. It's running for me, though the update script is throwing a ton of errors, that's a problem to fix for later. WARNING: Because this script only backs up the MAMP folder and not the MAMP PRO folder, it will not make backups of your databases. I've just found that out the hard way. I was able to get it working by copying the folder as @julian-tr suggested and then running the last line in the gist. @david-meza solution also worked for me. Can't believe 5.7 still isn't provided in the MAMP core though. Also it should be noted that after you run the upgrade you need to restart the mysql server or else you'll get information_schema errors when you run queries. You can repro this by opening phpmyadmin, selecting any table and clicking the Browse button. Restarting fixes that. 171005 10:41:42 mysqld_safe Logging to '/Applications/MAMP/logs/mysql_error_log.err'. The mysql_error_log.err file is empty. There is no other mysqld process running. Is there a way to see why it is failing ? Anyone try upgrading MAMP after this process and fixing things? I'd love to see a GIST for that process before I potentially break MAMP upgrades. @ronappleton 's code works fine for me. Thanks man!